We are pleased to present below all posts tagged with 'Fire Damage Cleanup'. If you still can't find what you are looking for, try using the search box. Home fires are devastating, but the danger does end once the fire is out. Find out what health risk still linger once the fire department leaves. Whether there is a short circuit in your home's electrical wiring, or you have a small accident while cooking, a fire can happen at any time. Your first priority is protecting the safety of yourself and your family. Once the fire is out is the time when you should begin to think about your possessions. Whether you’re facing a hot summer or fire hazards, you’d be wise to keep your home safe from flames. In 2015 alone, there were 1.3 million house fires reported in the U.S. From ovens to unclean chimneys; home fire hazards are everywhere. Fortunately, you can ward off the firemen with a few fire prevention tips. We’re covering them below. Experiencing a fire in your home is one of the most stressful situations any homeowner can experience. Even when the flames are out, the damage left behind from the fire, smoke and water damage is devastating. The challenge of restoring your home after a house fire may seem impossible, but it is not. If you have suffered a home fire, contacting a professional fire remediation company is one of the first steps to getting your life back to normal. Fire damage cleanup is a multi-step process that requires experience, proper equipment, and chemicals to get the job done right the first time. We have years of experience in fire damage restoration and your dramatic event is another day at work for us. This means that we can handle your problem fast and efficiently so you can focus on your family or business during this time. After the fire damage restoration is complete you can expect your home to look as good as it did before the fire (often better), and there will be no lingering acrid smoke odors. 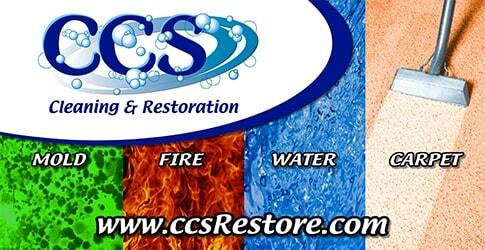 When the CCS Restoration professionals leave, it will be like the fire never occurred and the restoration pros were never there. A fire is a traumatizing event, even when no one is physically harmed, allow a recovery team with experience to take some of the work off of your hands and restore your property to normal fast.